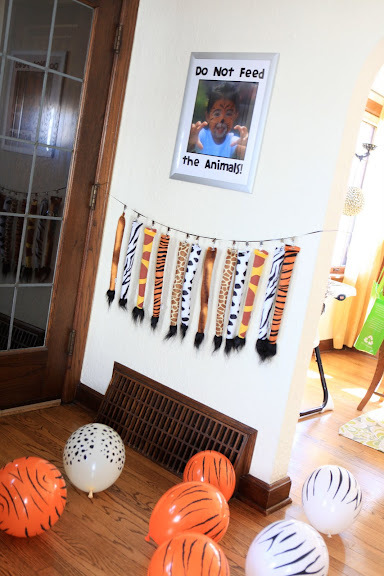 The decorations for EJ's tiger/animal party were very simple but still made a nice impact. Obviously I had a solid color palette of orange and black to work with, but I had to remember to not let those colors look Halloween-ey. I instead tried to play with animal patterns as much as I could, again without letting it get to be too much! 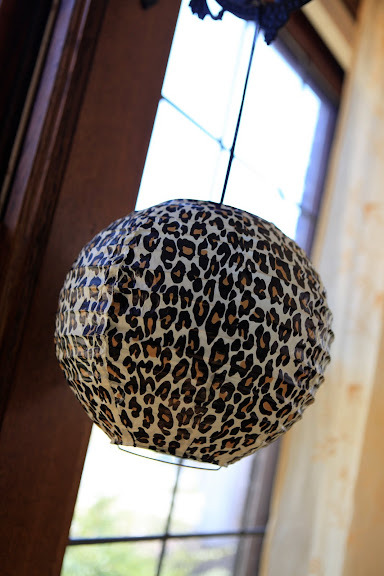 I found these animal-print lanterns at World Market and had to get them. I didn't have a clue where I would put them until 15 minutes before the party (and even then I needed help), but I still had to get them! Super cute, right? I also had the idea to make a "Do Not Feed the Animals" sign, but wasn't sure what exactly to do. Then I remembered a photo I had taken of EJ last summer at a picnic where she had her face painted. 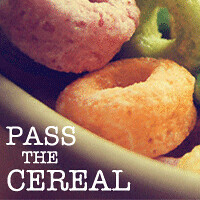 I cropped the photo (it was taken on my iphone so the quality was not ideal) and added the words in Illustrator. Then I had a 16x20 enlargement made...I think it came out pretty cute. I framed it and added it to the wall above these super cute animal tails I found for the girls to wear. I thought it would be a nice addition to the decor and then the girls could take them home (i only wish I had remembered to send more of them home...anybody need an animal tail or two?). I love having flowers in the house so I thought the party was a wonderful excuse to get some. I got two bunches of these flowers (I always forget their name) at the grocery store as I thought they had the perfect look for the party. 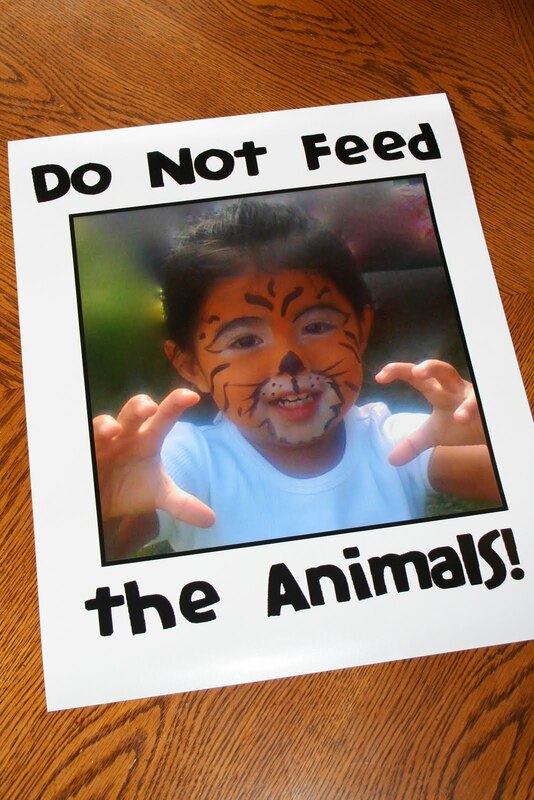 The adorable "I Love Tigers!" 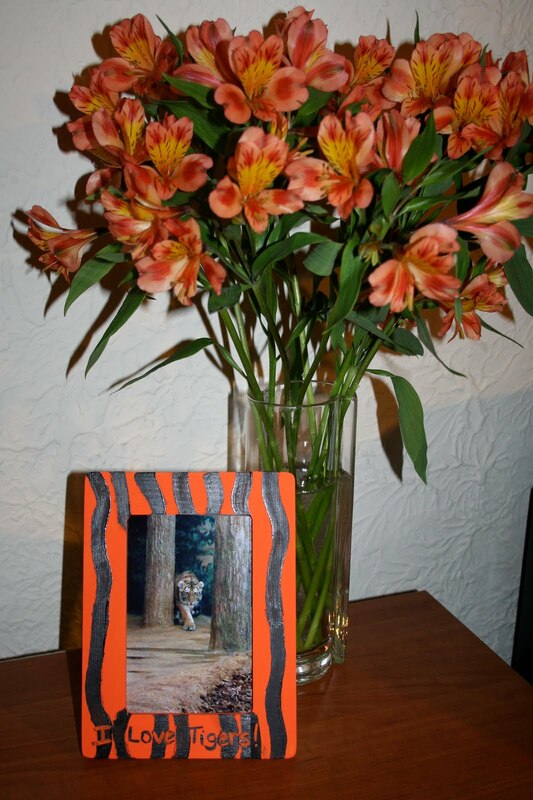 frame and photo was a birthday gift to EJ from her BFF Abbie. Perfect, instant decor! 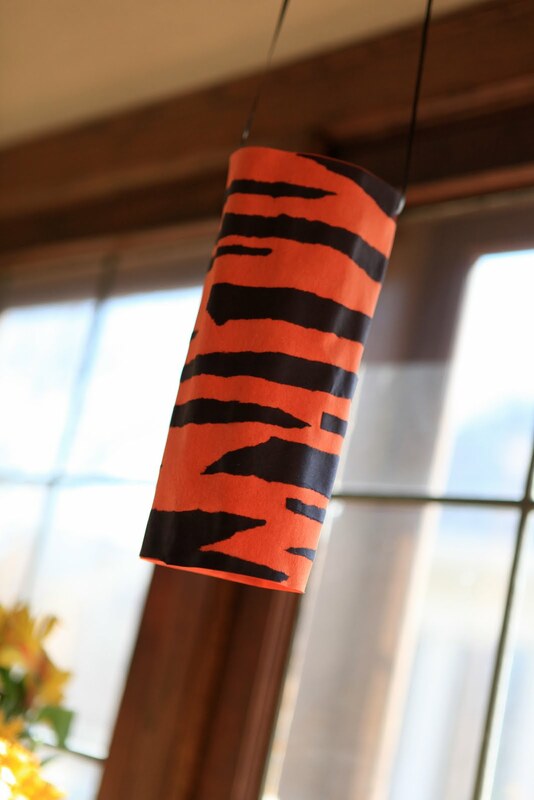 So what about those tiger striped lanterns you can see above the food table in the first photo? Super cool right? Would you be surprised if I told you that Jack made them all by himself...out of construction paper? 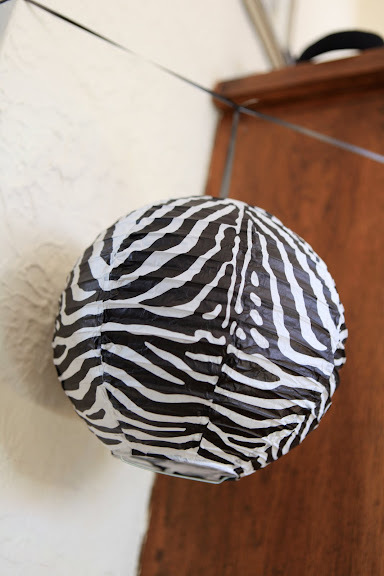 We followed this tutorial, but basically you rip black construction paper into random strips then glue the strips on to orange construction paper and let dry. I made a glue solution with glue and water so Jack did a wash over the whole page and then stuck the black pieces on, then did another glue wash over the top. The downside to this method is it took overnight to dry. I took over at this point (the kid was in school, darn it!) and rolled the paper into a tube gluing the ends together. I used white glue, which takes some time to dry, so I put large paper clips on both ends to hold the tube in place. Once the glue was dry, I hole punched the top and hung the finished lanterns with black curling ribbon. Really simple to make and I think they had an elegant look (especially once you know how they were made). The last thing the party needed was a Happy Birthday sign! I really wanted to do something special and I wanted to make a pennant banner. I had read on a blog somewhere that you could cut apart a birthday banner and spray paint the letters. I thought that sounded like a great idea! So I cut apart an old banner and sprayed away. This is how the letters looked after 3 coats of spray paint. Yeah...that was enough of that! So I printed the letters out in the same font as the invitations (the font name is Elephants in Cherry Trees...too perfect right?) and cut them out. I bought scrapbook paper in 4 prints...2 black & white animal prints and 2 orange/white prints...and I cut them into pennant shapes. I kind of eyeballed the size, but mine ended up 7" in height and 5.25" wide at their largest points. The letters were 2" in height. I laid everything out to make sure I liked it first, then used a glue stick to adhere the letters to the pennants. I used a 1" width animal-print ribbon (backside was plain orange) and stapled the pennants to the bottom-half of the ribbon (so 1/2" of the backside of the ribbon was showing above the pennants). Then I folded the ribbon over and glued it to the pennants with craft glue (pva glue would work too). The glue takes a little bit to dry, so I either kept the ribbon folded with my hands or small paper clips until it held. I kept the banner flat overnight to dry...and voila! Maybe I should save it in case she still loves tigers this much next year? Yet again your creativity blows me away! Love it all but am especially smitten with the banner! If you find you still have a plethora of animal tails I could use a couple at the hospital. We have a Halloween parade there each year and the kids like to dress up. I'm certain they'd get use. Where or where did you find the animal tails? Love them!!! Doing a 1st birthday party for our little tiger and would love to get some!